South Park Gardens is a beautiful Victorian decorative model residential park, designed in 1899, constructed in 1900 and opened in September 1901. It was restored in 2008/9 with a grant from the Heritage Lottery Fund – click here for details. It is Grade II-registered on the English Heritage Register of Parks & Gardens and is situated within the South Park Conservation area in Wimbledon within the London Borough of Merton.Click here to access a pdf about the history of South Park Gardens. Managed and maintained by the London Borough of Merton in partnership with the Friends of South Park Gardens, the Park provides a much needed and well-used green space in the heart of Wimbledon town centre. The Gardens are a five minutes walk from the town centre and main station and provide a tranquil oasis for local residents and people working in the area. 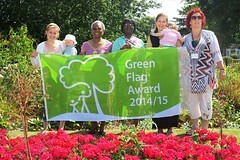 The gardening team is part of Merton Green Spaces. The gardeners are normally in the gardens on Tuesdays. They are responsible for maintaining the wonderful herbaceous beds, bedding plant displays and borders. A different team comes to mow the grass and specialists are responsible for the trees. There are more than 25 different types of trees growing in South Park Gardens, including limes, yews, a strawberry tree, a judas tree, cedars and many more.You can find out about them here. Many kinds of birds can be seen in the Gardens. Some live here all year round but others only visit at specific times. Find out more about the birds here. This is really the last and much delayed part of the Heritage Lottery Fund restoration of the Gardens. It includes new toilets, storage for the gardeners and Friends, a small kiosk and a room for the Friends.